The range of variation of the load cycles of furnace are quite wide, depending on size and general metallurgical requirements (for instance in melting or refining processes). Melting types have heavy current fluctuations because of arc instability and of charge movement, comparing to the refining ones. 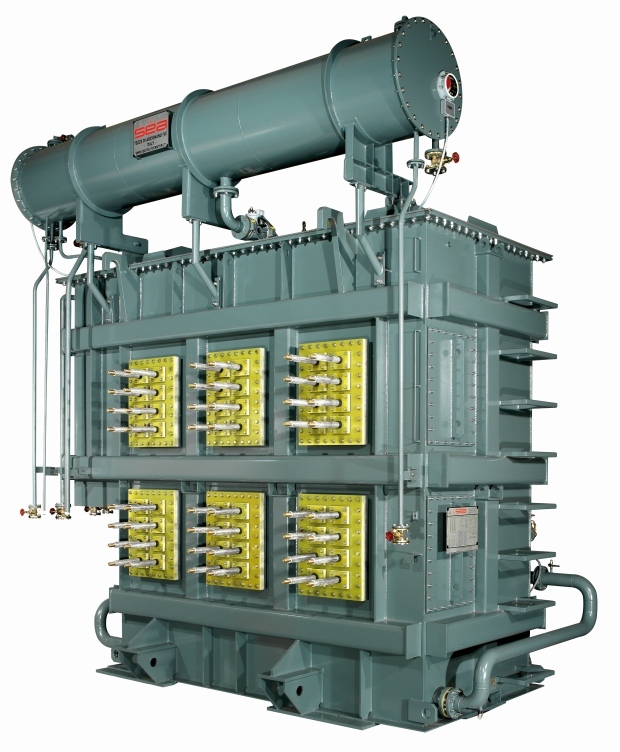 The main feature of furnace transformers is that they have primary side with high voltages and low currents and secondary side with low voltages and high currents. In the melting process is used direct current; the transformer is installed combinated with a rectifier that powers the furnace. DC furnace have higher resistance and put into the system less disturbances. In these furnaces there is a specific need to stabilize the arc during the melting phase. Another advantage of DC furnaces is that there is a lower electrode consumption per ton of steel produced; reasons is because the use of one electrode causes less electrical harmonics. DC furnace transformers are used in the melt scrap metal (e.g. steel plants). EAF transformers are suitable for steel furnaces, ladle furnaces (LF) and ferroalloy furnaces. They work under critical and severe conditions caused by overcurrents and overvoltages generated by short circuits in the furnaces. Arc furnace transformers are used for melting scrap metal. Usually when there is an EAF there is also an LF that is used to refine the metal melted by the arc furnace. Such kind of transformers are three phases. In front of EAF is usually installed a rectifier for a continuous and interrupted load. Reduction furnace transformers are used in the metallurgical industry, mainly in the ferro-alloy applications (ferro-silicon, ferro-manganese, silicon metal, ferro-nickel and ferro-chrome) and metals production like copper, tin, zinc, etc. Reduction furnaces usually are one phase. Special application furnace transformers are used for electrode material reducing and electro waste refining, for instance. Different solutions for each type of transformer with the purpose to get the most suitable configuration. This configuration is the most advantageous: it allows to use just one single magnetic core that means reduction of weight and losses. The taps usually are placed on the neutral end of the primary winding. The disadvantage is related to the step voltages that are not constant through the range of voltage regulation. The transformers can be equipped with an additioning star-delta switch (by this way a wide range for the secondary voltage is obtained). Such solution is used with medium and large furnace applications. 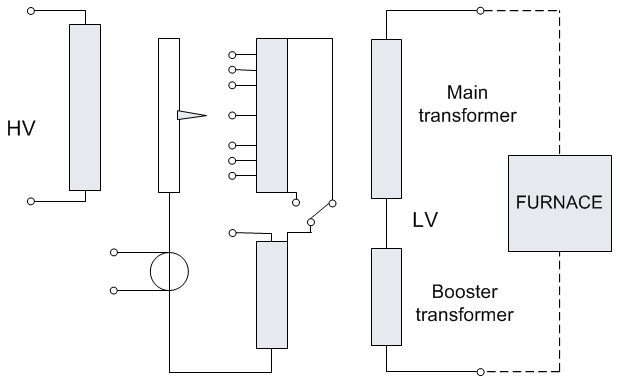 The booster transformer increases the output of the fixed secondary voltage of the main transformer. The tap changer is installed on the tertiary winding. The voltage and current values of the tertiary are selected by the transformer manufacturer: such way offers an optimization of tapping operating condition. The manufacturer with such configuration has the advantage that can select the most idoneus tap changer. 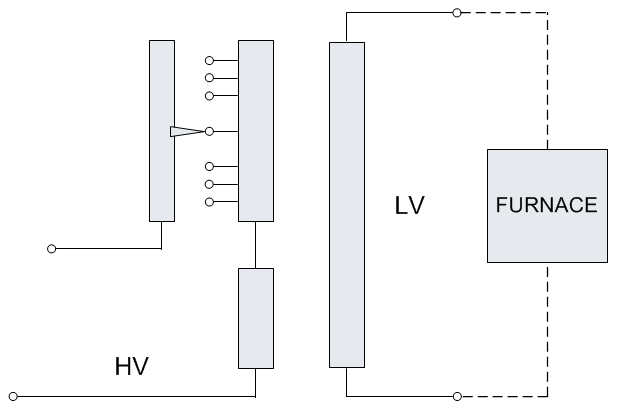 With this solution multiple voltages can be obtained; one option could be to use a series reactor with one OLTC. By this configuration is easy to get a system with small value and equal steps. It is used for larger furnace applications. The autotransformer reduces the voltage down to the primary winding level of the furnace transformer. The cores are two, housed in the same or separate tanks. Maximum flexibility for the manufacturer of the transformer because he could choose the most suitable tap changer.